Reason for Reading: A t.a. I had at university brought this book up constantly. It was The Book. 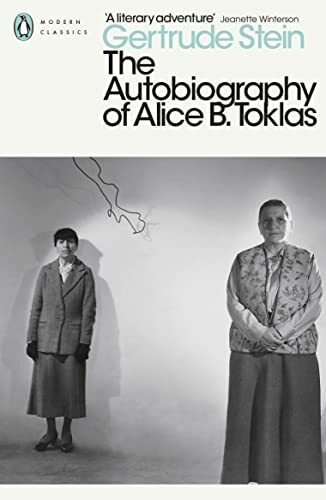 Synopsis: Gertrude Stein has cleverly crafted what is actually her own biography, as seen through the eyes of her longtime companion, Alice. Stein takes us through her early years, her time in Paris, and living in Europe during the first world war. Why you should read this book: Stein delivers a ballsy book, using Alice as a vehicle to sing praises of her own genius. Stein was at the forefront of the Modernist movement in literature, and she seems to have known everyone: her house was often the meeting place for people like Picasso, Braque, Gris, and other cubists, as well as writers like Hemingway. Stein writes during an exciting period of change in both the literary world and the art world, and offers the reader a rare first-hand glimpse of all the bustle and energy of the first two decades of the 20th century. Why you should avoid this book: If you can’t stand dinner party conversations, this might not be the book for you, because a lot of the story takes place inside Stein and Alice’s home. Despite the Modernist tag, the book isn’t hard to read, but it does take a reasonable amount of concentration. I was born in San Francisco, California. I have in consequence always preferred living in temperate climate but it is difficult, on the continent of Europe or even in America, to find a temperate climate and live in it. My mother’s father was a pioneer, he came to California in ’49, he married my grandmother who was very fond of music. She was a pupil of Clara Schuman’s father. My mother was a quiet charming woman named Emilie. Everybody went to the Cirque Medrano once a week, at least, and usually everybody went on the same evening. There the clowns had commenced dressing up in misfit clothes instead of the old classic costume and these clothes later so well known on Charlie Chaplin were the delight of Picasso and all his friends in Montmatre. There also were english jockeys and their costumes made the mode that all Montmartre followed. Not very long ago somebody was talking about how well the young painters of today dressed and what a pity it was that they spent money in that way. Picasso laughed. I am quite certain, he said, they pay less for the fashionable complet, their suits of clothes, than we did for our rough and common ones. You have no idea how hard it was and expensive it was in those days to find english tweed or a french imitation that would look rough and dirty enough. And it was quite true that one way and another the painters in those days did spend a lot of money and they spent all they got hold of because in those happy days you could owe money for years for your paints and canvases and rent and restaurant and practically everything except coal and luxuries. Haweis and his wife, later Mina Loy were also in Florence. Their home had been dismantled as they had had workmen in it but they put it all in order to give us a delightful lunch. Both Haweis and Mina were among the very earliest to be interested in the work of Gertrude Stein. Haweis had been fascinated with what he had read in manuscript of The Making of Americans. He did however plead for commas. Gertrude Stein said commas were unnecessary, the sense should be intrinsic and not have to be explained by commas and otherwise commas were only a sign that one should pause and take breath but one should know of oneself when one wanted to pause and take breath. However, as she liked Haweis very much and he had given her a delightful painting for a fan, she gave him two commas. It must however be added that on re-reading the manuscript she took the commas out. Also recommended: The Letters of Virginia Woolf Volumes I to IV by Virginia Woolf. Also by this author: Operas and Plays; Tender Buttons; Three Lives; The Making of Americans; Matisse, Picasso, and Gertrude Stein; Useful Knowledge; Geography and Plays; Composition as Explanation; An Acquaintance With Description; Lucy Church Amiably; How to Write; Before the Flowers of Friendship Faded Friendship Faded; Portraits and Prayers; Lectures in America; Narration; The Geographical History of America or the Relation of Human Nature to the Human Mind; What Are Master-pieces; Everybody’s Autobiography; Picasso; The World is Round; Paris France; Ida, A Novel; Wars I Have Seen; Brewsie and Willie; Selected Writings of Gertrude Stein; Four in America; Blood on the Dining Room Floor; Last Operas and Plays; Things as They Are.